Joe Harasymiak, who directed the University of Maine to its most successful season in program history in 2018, has been named the American Football Coaches Association FCS National Coach of the Year. On his way out the door, Joe Harasymiak achieved one final noteworthy accomplishment to cap the University of Maine’s most successful football season in program history. He has been named the American Football Coaches Association National Coach of the Year in Football Championship Subdivision ranks. The announcement was made at the AFCA awards banquet held in San Antonio, Texas, on Tuesday night. Mike Leach of Washington State garnered AFCA coach of the year recognition in the Football Bowl Subdivision, while Lenoir-Rhyne’s Drew Cronic (Division II), the late Jim Margraff of Johns Hopkins (Division III) and Morningside’s Steve Ryan (NAIA) are the other AFCA national coach of the year winners. Harasymiak, who last month left UMaine to become the defensive backs coach at the University of Minnesota, is the first Black Bears football coach to earn a national coach of the year honor. Harasymiak previously was named the AFCA Region 1 Coach of the Year. UMaine reached unprecedented heights in 2018, posting a 10-4 record while winning the Colonial Athletic Association championship outright. The Black Bears went 7-1 against nationally ranked opponents and also defeated a Football Bowl Subdivision team, Western Kentucky. Under Harasymiak, UMaine claimed the school’s first FCS home playoff win (55-27 over Jacksonville State) and its first FCS national quarterfinal victory (23-18 at Weber State). UMaine, which went 7-1 in the CAA after being picked to finish eighth in the preseason poll, was eliminated by Eastern Washington 50-19 in the semifinals Saturday. Harasymiak, a native of Waldwick, New Jersey, was a football captain at Springfield College where he earned a degree in physical education in 2008. 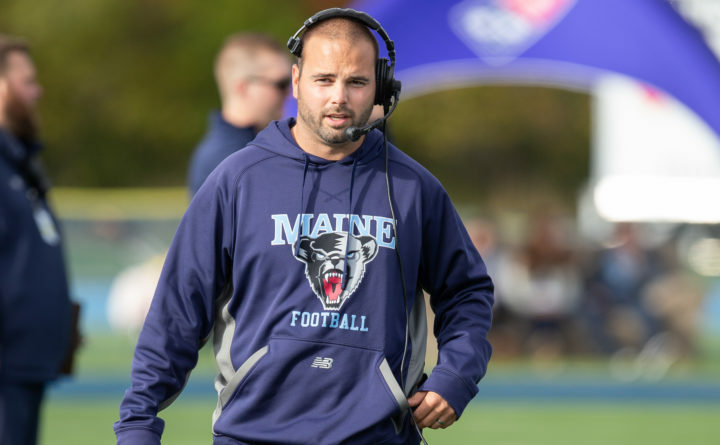 He had assistant coaching stints at Maine Maritime Academy in Castine and Springfield College before joining UMaine in 2011 as an assistant coach under then-head coach Jack Cosgrove. He coached defensive backs for three seasons before becoming the defensive coordinator and linebackers coach for the 2014 and 2015 campaigns. Harasymiak was selected to replace 23-year head coach Cosgrove in December 2015. AFCA national winners are selected by a vote of the active members at four-year schools in the organization’s five divisions. The AFCA has named a Coach of the Year since 1935.